Genbudo Cave in Toyooka City, Hyogo Prefecture, is the place where it was discovered that geomagnetic reversal occurred in the Quaternary era (dating from 2.6 million years ago to the present). 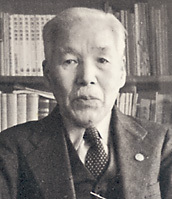 In 1926, Dr. Motonori Matuyama of Kyoto University discovered that basalt at Genbudo Cave exposed by a volcanic eruption about 1.6 million years ago had a polarity opposite to the present geomagnetic field. This discovery indicated that there was a period in which the earth’s magnetic field was opposite to what it is today. Called “Matuyama reversed chron” (dating from about 0.8 million to 2.6 million years ago), the discovery of the reversed period of geomagnetic field has greatly contributed to the development of the theory of plate tectonics. In June 2009, an international agreement was made to recognize the Matuyama reversed epoch as indicating the beginning of the Quaternary era, making it an index to be used for determining the boundary between two different geological eras. 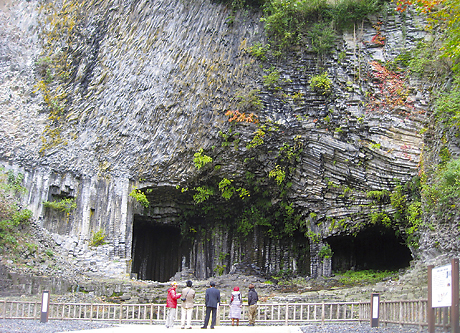 Genbudo Cave (basalt rock) was exposed by a volcanic eruption about 1.6 million years ago. 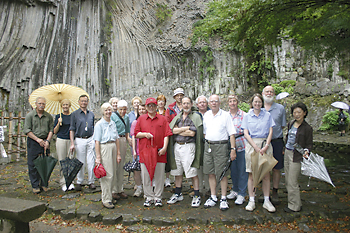 The cave receives many visitors from abroad. In the Quaternary era, the earth had a polarity opposite to the present geomagnetic field.